This page shows the latest lumacaftor news and features for those working in and with pharma, biotech and healthcare. 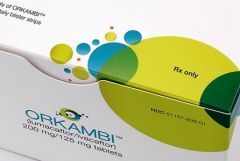 Orkambi is a combination of lumacaftor and ivacaftor, which together targets the lack of CFTR proteins in CF patients. for Vertex's Orkambi (lumacaftor/ivacaftor), a treatment for cystic fibrosis.